As you enter the second floor from the staircase in the Loeb Library you will notice three photographs, each seemingly independent, yet tied in a very intimate way. 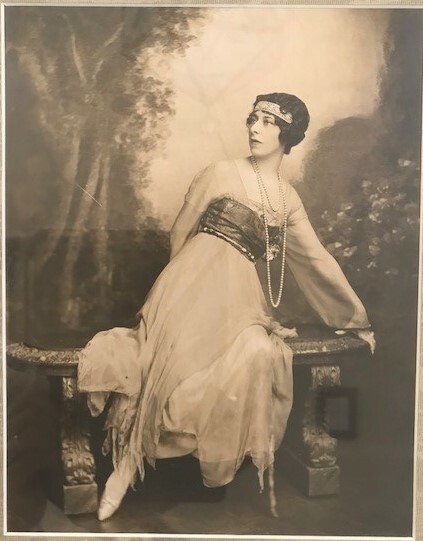 Two photos are of Metropolitan Opera soprano Geraldine Farrar, the other of her friend and amateur singer Clarisse Coudert. The first photo reads For Mrs. Nast – In Cordial Remembrance Geraldine Farrar New York 1911. During this time Mrs. Nast was referring to Mrs. Condé Nast, whose full name was Jeanne Clarisse Coudert Nast. Clarisse was from a high-society family of considerable wealth. She was married to the Condé Nast, the founder of the mass media company and publisher of Vanity Fair, Vogue, and The New Yorker. 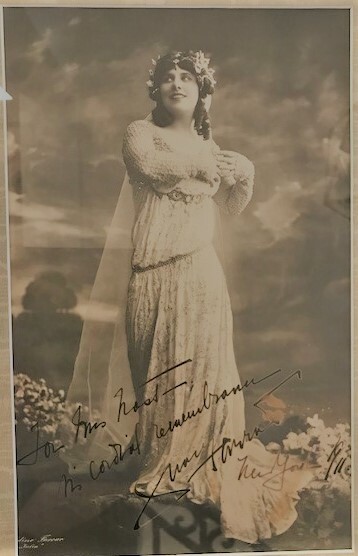 The third photo reads To Clarisse her affectionate friend Geraldine Farrar 1919, signed in pencil by the photographer “Alfred Cheney Johnston N.Y.” Johnston was known for his photographs of Ziegfeld Follies, actresses, and showgirls. Compared to many of his other works, this photograph is quite reserved. There is a change in demeanor toward Clarisse Coudert from “cordial remembrance” to “her affectionate friend” between 1911 and 1919. The middle photo ties the relationship of the photos together with an elegant capture of Clarisse Coudert. This photo is likely from 1915, as a similar photograph (same backdrop and dress) is found on page 9 in the October 23, 1915 issue of Musical America with the headline “Clarisse Coudert Enters Concert Field From Society.” The photographer is listed as Ira L. Hill Studio. In this same article, the final sentence mentions the close friendship of Geraldine Farrar and Coudert. An initial gift was given in 1990 by Gerald Warburg, long-time friend of the Loeb Library, great-nephew of Eda Kuhn Loeb, and son-in-law to Condé Nast and Clarisse Coudert Nast. 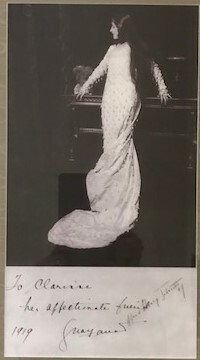 An additional gift of books, scores, and photographs was given by Jeremy Warburg Russo, granddaughter of Jeanne Clarisse Coudert Nast, in 2001. These photos were then framed and hung on our walls for our visitors to enjoy. Seebohm, Caroline. The Man Who Was Vogue: The Life and Times of Condé Nast. New York: The Viking Press, 1982. Johnston, Alfred Cheney. Alfred Cheney Johnston: Women of Talent and Beauty 1917-1930. Malvern, PA: Charles Isaacs Photographs, 1987. “Clarisse Coudert Enters Concert Field From Society.” Musical America, October 23, 1915. This blog is awesome good luck guys . Happy 125th Birthday, Lili Boulanger!